The greatest opportunities to learn science, math, English and social studies can be found by looking out the window. The school yard and the back yard are the first and best places for students to develop their understanding of place, because they are so accessible and can be experienced in so many ways over a day, a year or a life time. Once students connect to one place, they have a more solid context for broadening the boundaries of "place" from their community to the planet. Join us as we explore ways to use place-based learning as a way to develop knowledge, skills and understanding. Visit 3 School Gardens to see the different ways students can learn from being outdoors. Join us for pizza, conversation and a selection of short videos on how students benefit from being outdoors. Did you get a promotion? Take on a new job? Win an award? Receive a Grant? Let us know so we can share the news with your peers! What to Look for Right Now - MDC's list of What's Out There in September! Memberships - Welcome to a new member school - Louisiana R2 - Carey Scherder, Robin Ozellius, Nick Heggeman, and Robert Spoonster. Welcome to new members Kristine Sontheimer, Megan Dulany, Caitlin Horn, Julie LaConte, and Brenda Weiss. 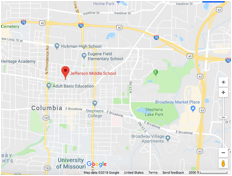 Networking - Look for MEEA at the Association of Missouri Interpreter's Workshop at Echo Bluff State Park September 11-14, and at the Science City Educator STEM Fest at Union Station, Kansas City, September 23. Conference - Registration is open. Grants - MEEA is now accepting proposals for its Environmental Education Grants. Deadline November 5. Fund Development - MEEA is seeking sponsors for the 2018 MOGSEE Conference. Board of Directors - The People Team met and developed the idea of Drought page to provide resources for teachers in parts of the state dealing with drought.